Atlanta residents love to be outdoors, and why wouldn’t you? With homes backing onto woods and nearby trails or new build communities with plenty of recreational zones, there’s always something to with friends and family. Southwest Greens wants to help provide an outdoor amenity right in your backyard. 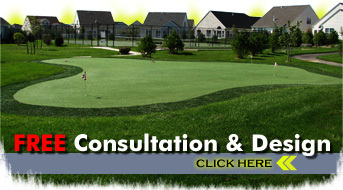 We specialize in the custom design and installation of backyard putting greens for homeowners. No matter your skill level, we can build an artificial golf short game space just for you! Our putting greens can be designed to fit any layout and space constraint. We use the same artificial turf material to create our golf practice areas as we do for synthetic lawns. The materials are built for heavy wear and tear, so you can enjoy a beautiful backyard all year long and never worry about pulling weeds or making sure the grass is the right height. Our artificial turf products are designed to stand the test of time and will look great even after snowfall during winter. Updating your outdoor landscape is one way you can help improve the value of your home for yourself or the next buyer. We make it possible to live a life where you don’t need to mow the lawn or worry about tracked in mud. Many residents throughout Atlanta have already asked Southwest Greens to install low-maintenance artificial grass lawns and backyard putting greens. Now it’s your turn! The time has come for you to request a free design consultation with Southwest Greens of Atlanta. You can soon be elevating your short game right at home. 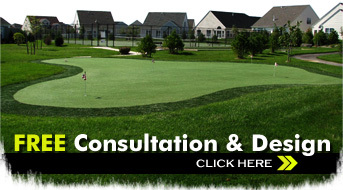 Contact our experts today to get started on your backyard putting green project!